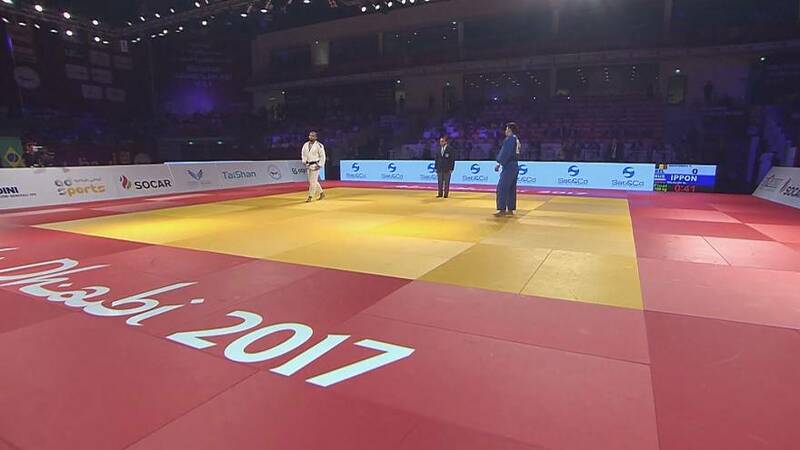 Our third and final outing at the Abu Dhabi Grand Slam fell on World Judo Day, the birthday of the sport’s founder Jigoro Kano. The final did not start well for Maret as he fell behind by waza ari. He then went to pin and hold his opponent down for the full 20 seconds to score ippon. This was his first win at over 100kg came at the perfect time – two weeks before he will compete at the World Openweight championships in Marrakech. “I’m really happy to have won this tournament,” said Maret. “It was important to come and fight with heavier athletes than me, in view of Next World Open Weight Championships. “I need to have benchmarks and sensations with the kumi-kata, and with athletes more physical than me. Our woman of the day was Natalie Powell of Great Britain who defeated two strong dutch women en route to the gold medal. Guusje Steenhuis was first to fall after a fancy piece of footwork from Powell. She then went on to defeat Marhinde Verkerk in the final. As she saluted her anthem, it dawned on her that she had become her Britain’s ever female world number one. That was really good, said Powell. “I was really happy to be able to beat both of them on the same day. “I have lost to them quite a few times in the past in the last cycle, but I feel like I am getting stronger and my tactics are getting better, so, yes, it was really good. “I think being the first number one for Britain is pretty cool, amazing. I am not entirely sure if it is the first ever. Spain’s Nikoloz Sherazadishvili was a surprise winner of a match up against the dynamic Georgian Beka gvinaishvili in the under 90 kilograms final after he countered the Georgian’s attack in mid air to score ippon and claim his first ever World Judo Tour gold medal. It was Spain’s second medal of the grand slam and their only gold. Russia’s Nijaz Bilalov stunned Toma Nikiforov the experienced Belgian in the under 100kg final, scoring ippon with another counter attack, sweeping away Nikiforov’s right leg as the Belgian placed all his weight on it to launch an attack. Tessie Savelkouls of The Netherlands defeated Azerbaijan’s Irina Kindzerska in the over 78kg final taking her second Grand Slam gold of the year. And finally, on a day of counter attacking judo, our move of the day was this amazing ura nage from Russia’s Alexander Roslyakov.